animal, animal rescue, baby seagull, bird, Vancouver B.C. A badly injured baby seagull is getting at least a chance at survival thanks to the Wildlife Rescue Association of B.C. and a South Granville BIA Concierge. Friday morning at about 11 a.m. Tom Sutherland, one of the security guards employed with the South Granville Business Improvement Association’s Concierge program came across a baby seagull in the course of patrolling the alley on the east side of South Granville Street near 14th Avenue. 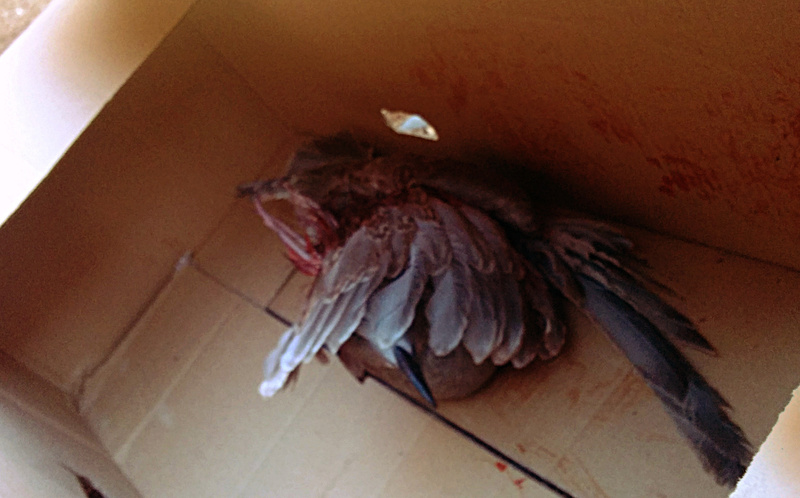 The young bird was bleeding and badly maimed, with one or both wings broken. A cyclist suggested calling the wildlife helpline (604.526.7275) of the Wildlife Rescue Association of B.C. (WRA). Tom called and the WRA explained that if he could corral the bird and secure it in a box they would find a volunteer to come collect it. The bird put up a bit of resistance but Tom gently placed it in a large cardboard box. Among other things, the box would have helped shelter the badly-injured bird so it didn’t succumb to the sub-zero temperatures before the volunteer arrived. Tom closed up the box and labeled it clearly: “South Granville Security. Injured bird. Waiting for pickup from Wildlife Rescue” and he included contact numbers for both himself and the WRA. Before continuing on his patrol, he left the box where he told the volunteer it would be; close to where he found it, but out of the way of cars or foot traffic, in the alley behind an apartment building on 14th Avenue. About an hour later he got a call from the WRA volunteer and the two met at the agreed pickup spot. But the box was nowhere to be seen. Just before the volunteer was about to give up and drive away, they saw it. Someone had moved the box out of sight beside a car in a parking space behind the apartment building. A Concierge’s job is, in large part, to help make South Granville a peaceful and civil place for shoppers. I believe such small acts of empathy and kindness are the stuff that such peace and civility are made from. Even if it’s not part of Tom’s job description as a South Granville Concierge to try and save baby seagulls it reflects well on the South Granville BIA that it’s part of his character. Click the image to enlarge it.